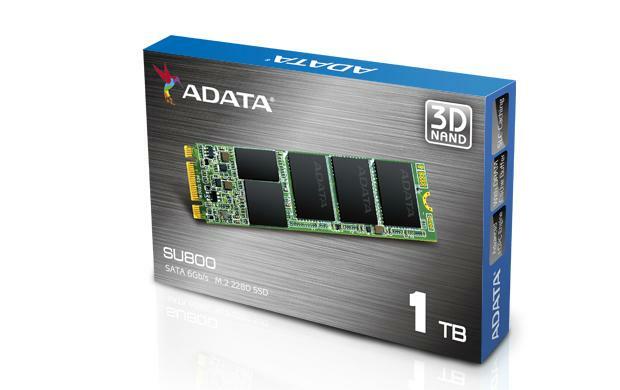 03 November 2016 – ADATA Technology, a leading manufacturer of high-performance DRAM modules, NAND Flash products, and mobile accessories today launched the M.2 2280 version of the Ultimate SU800 3D NAND SSD. With higher density, faster performance, and longer lifespan than 2D NAND SSDs, the new SU800 fits on a compact card while still available in 128GB, 256GB, 512GB, and 1TB and offered at very attractive price points. It supports a DRAM Buffer and SLC Caching mode to boost performance up to 560MB/s read and 520MB/s write, with LDPC error correction, Data Shaping, and a RAID Engine to bolster data integrity. For users that want a simple, cable-free, and low energy draw SSD upgrade, the SU800 M.2 2280 has much to offer. The SU800 M.2 2280 fits on a compact PCB and slots directly into M.2 ports, which are increasingly common on desktop PCs and the standard on notebooks. It uses 3D NAND with an SMI controller and fits up to 1TB. Unlike 2.5” SSDs, it does not require cables and only needs very minimal power, supplied straight from the motherboard. The direct motherboard link also helps reduce latency and increase performance by roughly 10% compared to 2.5” SATA 6Gb/s drives. The SU800 M.2 2280 reaches 560MB/s read and 520MB/s write. It also lasts longer than 2D NAND drives, with an MTBF (mean time between failures) of 2,000,000 hours versus 1,500,000. The SU800 M.2 2280 integrates a DRAM Cache for speed acceleration on demand, complemented by SLC Caching mode (single-level cell performance). For data integrity and safety, LDPC (low density parity check) error correction, RAID Engine, and Data Shaping are deployed, the latter helping even out read/write cycle loads to prolong SSD lifespan. Like all M.2 cards, the SU800 needs very little power to operate. It helps extend battery life on notebooks and reduces overall system power requirements for users building a desktop PC. The drive uses DEVSLP (Device Sleep) technology to go into a dormant, extra low-power state when idle to reduce energy consumption even further. For users moving from 3.5” and 2.5” mechanical drives, the SU800 M.2 2280 offers a striking increase in performance combined with a massive reduction in drive size, noise, heat, and energy draw. Even for SATA 6Gb/s SSD users, it presents a much simpler, neater, and more reliable SSD solution that is well worth considering. Like other ADATA SSDs, the Ultimate SU800 M.2 2280 includes licenses for SSD Toolbox drive management and Migration Utility data migration apps.